today’s question: what is your favorite project that you’ve worked on? the first thing that comes to mind was working on novelty product while designing at kate spade. i went to school for graphic design and never thought that i could take my degree past packaging (now i know the possibilities are endless). the best part about working in fashion (for me) is walking down the street and seeing a girl carrying one of my designs. knowing that she saw what i created and had this connection to it that made her have to have it. those moments make me scream like a little girl. i once passed a woman on the street carrying a handbag i designed. she was in her 60/70s in the dead of summer wearing a flowy white dress, florescent nail polish and my bag! i did a fast turn around, walked really fast to pass her, and then turned around to walk back again and get . she totally caught me, but i couldn’t resist. my second favorite project was one that took me out of my comfort zone. i was working with an ad agency who had a menswear client that wanted their products illustrated. they really liked my style and wanted to work with me but asked me if i was open to letting go of my coloring-book style illustrations. they wanted the project to feel more elevated and have some depth. i was totally down to work around them (and get a new client!) so i said yes. it was fun and refreshing to try a different style. are to this day are one of my favorite projects. my favorite project, i did for free. with my friends. i was able to be creative, feel comfortable, no pressure, they trusted me, and we had the same vision. it was a nice break from the back and forth with (sometimes) picky clients. of course, you should put your everything into any project you do…and money is nice and all…but the occasional just for FUN projects are the ones that keep me going. you know how sometimes you can become insecure if you are working with a client that you aren’t vibing with? and how it’s so refreshing to send someone your work and they love it immediately? we all need projects like that every now and then. they keep us happy. i always stress the importance of surrounding yourself with creative people. people who just want to create good looking things in this world. people who are passionate and interested. people who aren’t hung up on money and just love art. look at me, going all hippy on ya! so this ban.do lookbook was one of my favorites. quick, entertaining and the creative jolt that i needed at the time. it all depends on the company and the weather. i thinks it’s important that no matter where you interview you feel like yourself. you want to feel confident and comfortable. the outfits below below are based on my personal style and the fact that it’s winter and i live in nyc. i chose one fashionable and one laid back company to dress for. they are all about the bright colors and fun shapes. i would wear this from uniqlo (maybe with a ), these (love the stripe!) from kate spade, uniqlo’s , a , big and a .
they are uncomplicated, down to earth and easy going. i would wear (jcrew’s toothpick jeans fits so well), a , a striped , army green (i’ll take a cab) and this would be perfect to hold my ipad and papers. here’s what i would wear if i had an interview with, let’s say…! first, study what colors that brand is drawn to. loosely base your outfit on something that would be seen in their store (i know anthro likes texture, pattern, layers, color). but most importantly, wear something you love and that tells a story about you! i think it’s a little obvious to wear a decked out anthropologie outfit to the interview, so i would probably wear something with a similar vibe and then pair it with some accessories from their store. and remember, a manicure is a must. 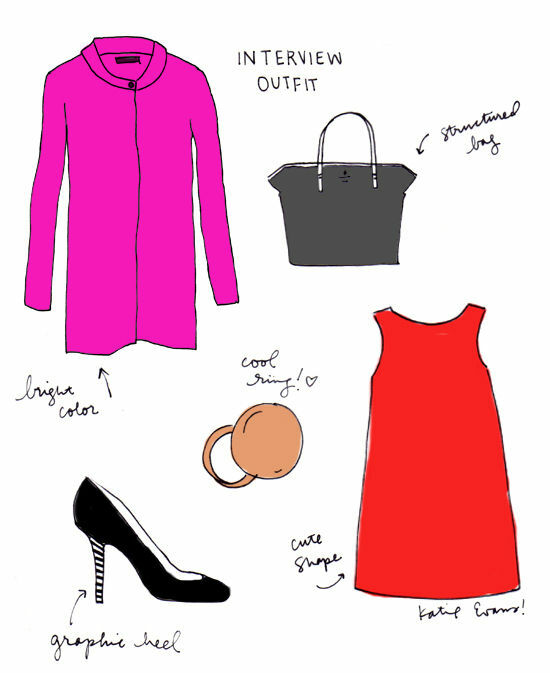 shop these items: asymmetrical coat, striped dress, shiny mini-wedges, bright pink tights, canvas ipad case, wolf ring. today’s question: i have a job interview coming up. what are some of your interviewing tips? i haven’t been on too many job interviews but i have had to meet with new clients. you can apply these tips to those meetings as well. dress for the job you want, not the one you have. this could all depend on what type of company you’re going for, but dress up! wear heels. put in the effort. don’t wear a lot of jewelry (especially bangles. they’re loud and distracting) and make sure what you’re wearing is comfortable, fits right and makes you feel confident. give it a test run first. how does it feel when you sit? does it wrinkle easy? one time i was interviewing at a company and i chose to wear this new top i had recently bought. i hadn’t worn it before and boy do i wish i could go back and change my outfit. the material was heavy and it was tight in the wrong places. naturally i was nervous and i was sweating. i could see the hiring manager staring at my sweat stains and it totally threw me off my game. i didn’t get that job. arrive on time. this one seems like a duh, but you never know if you’ll get into traffic or get lost. plan to get there half an hour ahead of time. you can always use the extra time to check yourself in the mirror (no lipstick on your teeth!) or go over your resume. present yourself at your best. give your hiring manager or new client a firm handshake! nobody likes a wussy one. bring multiple copies of your resume (if they like you immediately, they may want to introduce you to other people). look people in the eye when you talk to them and don’t forget to smile! if you’re presenting a portfolio make sure your nails look nice—they’ll be looking at those a lot! be prepared but also authentic: the best interviews i have been on in the past i remember feeling comfortable and calm. there is something to be said for being prepared and i am a total nerd about this. i plan my outfit the night before, i prepare questions for them (you have to show interest in the company. even if you don’t have any questions, do your best to think of at least one) and i try to anticipate the questions i will be asked and what i would respond with. but i try not to go overboard with the canned answers because i want to be authentic and in the moment as well. you don’t want it to see like you are just reading off a general answer. bring something memorable: i remember a few years ago i was going in to meet with the girls and they were interviewing me about some graphic design work. i had admired the comapany aesthetic and did my research beforehand. i knew the girls loved sweets so i brought some chocolates and a little 3-d card thanking them for meeting with me. i think they still have the little pop-up card at their office. people notice that extra effort. my intern last year, marissa, brought a box of cute treats all in one color. teal scissors, teal string, teal glitter…it made a statement. 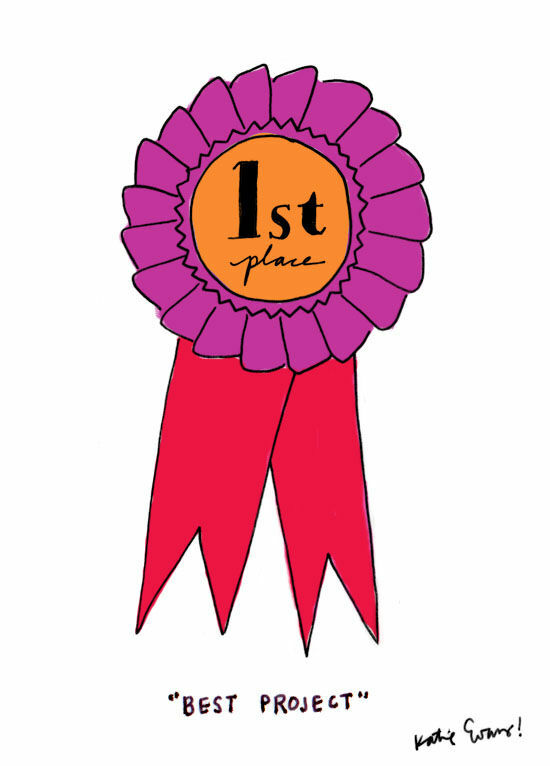 i interviewed a gal yesterday that gold-leafed her resume…impressive & memorable. bring supplies: i always bring my business cards, resumes, pens, a journal, ipad, tick tacks, lipstick, examples of work (either loaded on the ipad or printed). you want to show them that you are organized and prepared. eye & confidence: seems easy, but when your nervous these things are the first two to go. try to avoid nervous rambling, just stick to the point. follow up: i usually send a follow up email after the interview. let them know you’re interested and excited about the opportunity! as always, try to personalize your emails…mention something you chatted about in the interview, say what excites you most about the position. when i hire someone i am looking for personality! i don’t think so. i have never given them. my budget doesn’t allow for it. i think it’s nice when you can, especially if it’s something with thought (maybe it’s handmade!). i see other freelance friends getting lavish cookie baskets and they’re wonderful gestures but beyond my means. this year i’m hoping to get my act together and send out a new years card (i’m already too late for the holidays). if that fails then maybe it will turn into an ecard and i’ll make it a gif. i think sending something is a nice gesture. if anything, it reminds your clients that you’re still out there and they had a great time working with you! i think as designers, we have a lot of branding plans…we think up fun ideas we could send out to people in adorable branded boxes…we really want to have it all together. but time slips away from almost everyone during the holidays, right? it becomes hard to even find the time to buy gifts for those special family members. and people understand that, because they most likely are just as busy. i think it’s nice to send a little note or gesture right after the project is finished. last year i made these little handmade gifts to send out during thanksgiving. i think whenever you can make it work is perfect. maybe it’s even more special to receive a gift on a random tuesday rather than for the holidays. 2. send them a 3. make them a rubber stamp or stickers with their logo. more on that here. 4. just send a cute card. that’s definitely enough. browse through these archives for card ideas! what’s some of your favorite desk items? we love collecting them!